NEXT EPISODE: Death in the Outback. Come see us at Rose City Comic Con, September 10-11! Animal Man #5, “The Coyote Gospel,” will forever change your relationship to Looney Toons. In which Jay and Miles return to Rose City Comic Con; “Having a Wild Weekend” is the mash-up t-shirt of Excalibur stories; swears are for everyone; Arcade is not a subtle villain; we love Art Adams a lot; Minor-Domo is the Harvey and/or Janet of the Mojoverse; Kitty gets another new costume; and the X-Babies carjack their creators. We are so ridiculously lucky: our hometown con is the coolest. It’s only a few years old, but Rose City Comic Con is one of the most fun, accessible, welcoming, and all-around celebratory comics shows we’ve ever been to. This was our first con as Rachel & Miles X-Plain the X-Men, and our first ever live episode; and we can’t imagine a better place to start. Art by David Wynne. Prints and cards available until 10/4/2015 at the shop, or contact David to purchase the original. Someone left Rachel alone with the button press. WHOADANG, it’s the brand new zines and con-exclusive t-shirts! Punk Cyclops was one of our favorite cosplays of the show. Awesome going as well as coming! Our friend Sarah–a kickass pro photographer in her own right–was cosplaying as Rule-63 Phil Sheldon of Marvels! Rachel’s heart 100% belongs to Norita Smoeuk’s 50s Girl-Gang X-Men. These three were part of a whole group cosplaying Norita’s wildly kickass designs. Even Marvel characters are sufficiently confused by their own continuity to need our help! Benja Barker of Portland’s Alter Egos Society hooked us up with this incredibly cool X-Men belt buckle, which sneakily velcros around pretty much any belt. Monsters of Podcasting celebrating at the Kaijucast booth after our Sunday panel. L to R: Rachel and Miles; Zee and Jamie of the British History Podcast; Kyle of Kaijucast (and our producer!). Damn, there were a lot of you. HI, PORTLAND! Magneto and friends hang the Days of Future Past wall. Everyone from Rose City Comic Con; but particularly Mikey Nielson, Ron Brister, and Paula Brister. Team X-Plain: Tina Abate, David Wynne, and Kyle Yount. The Absolute Goddamn Best: Katie Moody and Anna Sheffey. Last but not least: Max Carleton, Dusty Eppers, Jason Betournay, Scott Hazle, Fern, Kestrel, Jasper, and everyone who turned out to help, yell, party, and X-Plain with us at and after RCCC! In which we record our first live episode; Rose City Comic Con is AMAZING; Ann tells us how to torture the X-Men; Jean Grey needs more friends; Chris survives an encounter with an angry vampire; Squirrel Girl sets the high bar for questions; everyone has opinions about Longshot’s hair; Jeff gets meta; Cyclops is the best at fighting Sentinels; and Rachel ALMOST gets through an entire panel without swearing. There’s no visual companion this week, but you can see photos from the panel, party, and more in our Rose City Comic Con roundup! Announcing: Rose City Comic Con panel guests! 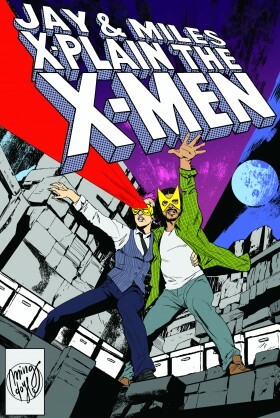 Hailing from the pages of X-Men: First Class and Exiles–along with a slew of other superhero and creator-owned comics–Portland’s own Jeff Parker! Crossing X-media, from animated series and feature films to comics; co-creator of X-23, and most recently, writer of Amazing X-Men—Christopher Yost! And finally: Writer, editor, journalist, and filmmaker; industry legend; long-time X-Men editor; and creator of Longshot–Annie Nocenti. Hope you survive the… you know.